I ended up with this guitar as a result of stating that I needed a "beater", so that I could keep my good guitar out of the hands of certain people. So, she ran across this one and bought it for me because "it was pretty". 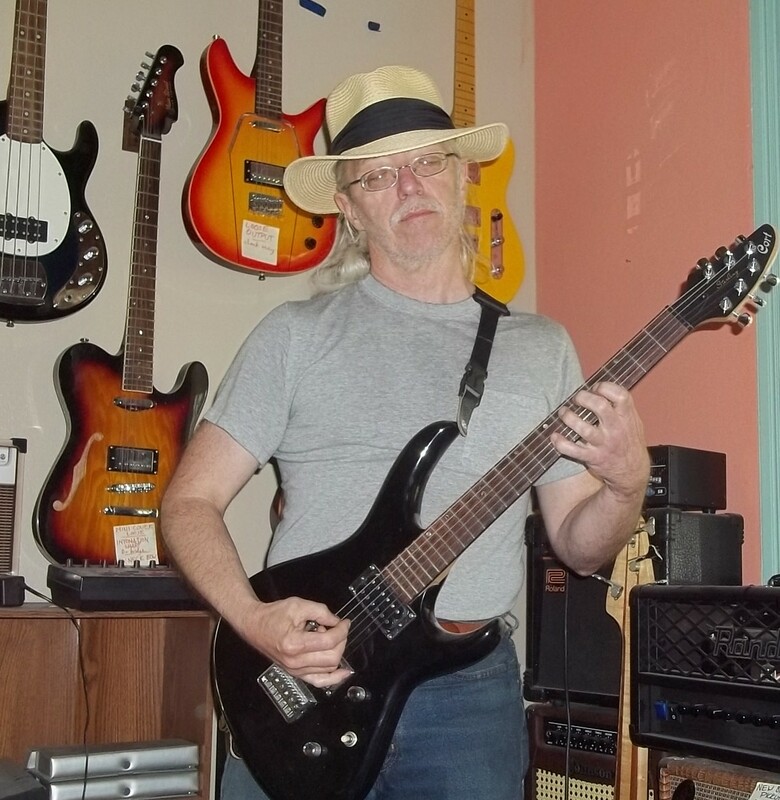 I was psyched when I saw it was a washburn "because nobody around here plays them, (and I have been playing for 30 yrs). I quickly started setting it up. Setting the neck relief from being almost straight to specs and then cut a custom bone saddle (action was a little high but not too bad, for the already low cut saddle). I cut the saddle pretty much standard compensated "B" style and then stated tuning it up. The intonation was way off. Measuring the scale length showed 25 & 1/4 to the front of the saddle slot. So I came to the washburn site and looked up the specs. 25.5 scale length! Uh oh! So a short trip to my buddy to check this thing out and keep it secret from my wife. He looked at it without even checking it out and said "firewood". " Two to one says it has a dowel neck. And possibly epoxied. And washburn is no help at finding out". Then he showed me the belly (which is low but there) saying it was probably ok when it left the factory, but doomed as soon as the belly started to develop. I told him about the scale measurement, and he put his saddlematic on it and said the saddle needed to go back at least 3/16th. He said the best that he could probably do without it costing more than the guitar is worth, would be to put a oversized shaved saddle on it. Which wouldn't be cheap, because it may be epoxied on. So, does anyone know about the construction of this guitar? I emailed washburn a few weeks ago asking about their construction methods on this guitar and got NO response. Now I know why the only washburns that I see around here are electrics. Okay, I'm going to play straight here, but in a roundabout way. I like Washburn guitars. A lot. However: the company has to pay bills, & can't rely on 200-unit handcrafted guitars to fly out the door, so cranks out literal TONS of "beginner" guitars. The sad reality is that people WANT cheap guitars, & would rather compromise than pay a dollar or two more. So the brands cut corners, the factories cut corners, the retailers cut corners. It's usually in QC -- quality control -- so guitars go to market that are at least badly in need of a simple setup & in some cases are close to falling apart. It's a caveat emptor world. And when you're talking a "beginner guitar" (like, say, the D10 ), it's almost always being bought by a non-playing adult to give to a kid who don't yet know nothin' about what a proper action LOOKS like. Therefore, thousands & thousands of cheap guitars enter the market every year. Many of them are parked in closets, where they sit for years, & eventually are trotted out & sold online as VINTAGE even though they're the same unplayable crapboxes they were a decade or more previously. Fact is that the D10 (D100, WD10, WD100) has -- for 40-some years -- pretty much held the line as the CHEAPEST of the Washburn acoustics. I really enjoy my Washburns, but I cannot fathom why Blue Book says the unwired acoustics are worth ~$200 & the a/e ~$275. In my opinion, this is high even for the spruce-top versions, in perfect condition, with a professional setup. I have a sideline buying & selling used guitars... almost entirely electrics because even if there are "undisclosed issues" I can turn a profit by parting it out (like selling a twisted neck for $26). In my not-so-humble opinion, the only person who'd buy a used acoustic without first thoroughly checking it out is either wealthy or foolish (& maybe both). Most D10 are plywood throughout. Nothing wrong with that: I've got an Aria & an Alvarez that are my go-to dreadnoughts. If plywood "settles in" well, it can last a century, sounding & playing well all the way. And by that I'm implying that not all plywood DOES settle in. Neither does all "solid wood." Cheap guitars are built in factories, on assembly lines, & shipped out by the literal ton. There is a HUGE amount of potential unit-to-unit variation in tonal quality alone... as there is with USA Fender Strats & small-shop handbuilt acoustics, in my experience. Shopping for a new guitar, a sensible person would sit down with a bunch of them (10 would be good, 20 even better, but AT LEAST FOUR) & slowly winnow it down to the one that sounds & feel the best ("pretty" be damned), because I guarantee there WILL be differences. Yours has a "solid wood" top rather than plywood. There's going to be a LOT more variation in quality (physical & tonal) from one to the next, not to mention effects from any previous owners (high ambient humidity, low ambient humidity, sitting in the sun unplayed every day...). You are now experiencing why I prefer plywood tops for working guitars: CONSISTENCY -- if it sounds good early, it'll KEEP sounding good. A single ply can go all to hell quite suddenly & in a variety of interesting ways. I once had a 12-string (non-Washie) I loved... but had to dispose of because the ENTIRE body was beginning to fold in on itself. Have you ever heard the colloquialism "trying to polish a turd"? That's where you're at; blaming Washburn ("Now I know why the only washburns that I see around here are electrics.") for getting a guitar-like gewgaw ("she bought it for me because "it was pretty"") is inaccurate at best. Dude: you WANTED a beater, you GOT a beater. Your choice now is whether to spend a few hundred $$$ putting a new top on a guitar that will never be worth $300. Time to move along. First, buy from a reputable dealer, someone who will take a guitar back (or at least properly repair it) if you aren't happy with it. A place down the road from me will do a free annual setup, forever, on ANY new axe it sells (which is an incredibly smart marketing move), & will do same for higher-end used guitars. Second, figure out what you actually WANT, not whether you are willing to work with some semi-playable POS merely because it's handy. Third, DO SOME SHOPPING. In your range, I'd push for a new Oscar Schmidt OG2CE, which can be had for under $170, available in "Natural, Black, Flame Yellow Sunburst, Flame Black Cherry, White" & even spalt maple. Their plain OG2 drifts past for <$150 new, & (having test-played five) is a bargain. First, this was purchased by my wife who knows nothing about guitars but, recognized the washburn name. Thats why I'm trying NOT to discard it. I'm trying to spare her feelings. To keep her from feeling bad because she thought that she had done something good. Had I been there to try out this guitar, it would have never been bought. It would probably ended up on Ebay being sold by a reputable seller ( like it's original seller, Guitar Center , if you can call them reputable). That why my friend's store personally checks every guitar that comes into the shop, new, used, or otherwise. So, it's all arranged. This one is going to have the bridge removed, top patched, and replaced with a slghtly shaved bridge. That should give it more years service than it has had so far. I dont know why anyone would want to replace the top. As thats not even close the the normal repair procedure for this kind of problem. Because as soon as the new top starts to belly, as they all do, you're back to square one. The normal fix is a neck reset. I have a stable of acoustic and electric guitars from cheap to fairly expensive. I have ordered many and never seen a guitar like this make it out of the factory without being deemed a "B" grade. I have had solid tops, plywood tops and everything else. But I have never had to call a company to see how expensive a model is required to be for the QC's to pay attention. I am the local guy all the young guys run to, to check out their guitars, ask advice, and check their newly purchased $1000 gibsons to make sure the "professional setup" from guitar center is up to par. I have had beaters. Just handed one down actually, that's the reason I needed the replacement ( I have a pre- gibson epiphone, a J-200 custom gibson and a Dixon dg6 hummingbird in acoustics. Not to mention my electrics). But I have to say, if a newbie walks into the shop and asks about a washburn, I'll have to point over to the wall at a Indiana scout and be like " That is a good starter. It's neck is good. It has decent tuners, so it will stay in tune. Yeah, it has a plywood top, but it doesn't sound too bad. It will last you until your ear develops and you can save enough to move up to something better. I've had one washburn, and it wasn't a "beater". It was a piece of crap that came from the factory that way. Stay away. Far away." So, since this forum has been as helpful as the washburn company, I don't need to come back here anymore. Ascertainment of the block is done for the comfort of the people. The chance of the I discussion and visits of the https://www.studential.com/university/guides/how-prepare-your-first-job-interview are beneficial. It is secured for the total scenario for the participants.